Javier Hernández Balcázar was born on the 1st June 1988, in Guadalajara, Mexico, and is a soccer player, known also by his nickname Chicharito, who currently plays for the German club Bayer Leverkusen of the Bundesliga. 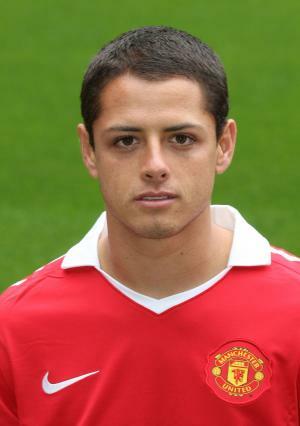 During his career he has also played for Guadalajara and Manchester United of the English Premier League. Have you ever wondered how rich Javier Hernandez is, as of mid-2016? According to authoritative sources, it has been estimated that Javier`s net worth is as high as $17 million, an amount he has earned through his successful career as a soccer player. Javier grew up in Morelia, Michoacán, where his father played soccer for the local team, as did his grandfather, Tomás Balcázar. While there, he went to the Instituto Piaget, which is an elementary school, and also played soccer for the school`s team. Little by little his love for the game increased, and he joined C.D. Guadalajara when he was nine years old. Six years later, he signed his first professional contract, which marked the beginning of his career. He played for the C.D Guadalajara in 64 games, and scored 26 times; in his first season he played in only eight games and scored one goal. He continued with poor performances, however, in his fourth season he played in 28 games and scored 21 goal – his net worth increased accordingly, as he was then spotted by the scouts of the English Premier League club Manchester United, and in no time he was bought by the club in July 2010. At the end of the season he returned to Manchester, but he was bought by the Bundesliga team Bayer Leverkusen, and signed a contract with his new team, which only increased further his net worth. He debuted in Germany on the 12th September, against Darmstadt 98, but was scoreless, like his whole team, as they lost 1-0. However, in his second game, he scored his first goal, against the Belorussian side Bate Borisov in the Champions League`s group stage. In his first season at Leverkusen, Javier played in 40 games overall, and scored 26 goals, lighting up his career, after a slump at Manchester and Real Madrid. During his team career, Javier has won several awards, both as an individual and as a part of the team; with C.D Guadalajara he won the Primera División de México Apertura in 2006, and was the top scorer of the league that year. With Manchester United he won the Premier League in the 2010-2011 and 2012-2013 seasons, and with Bayer Leverkusen he was named the Player of the Month in November and December 2015, and January 2016. Javier has also been playing at international level; with Mexico he has won CONCACAF Gold Cup in 2011 and 2015. He has played 86 international games, and scored 45 goals. Regarding his personal life, he was in a relationship with Lety Sahagun, and is currently in a relationship with Lucia Villalon. Javier has been the UNICEF ambassador for Mexico since 2012, participating in numerous events, speaking about how much education is important in life – his audiences are mostly children.